Queen, one of the most successful and dynamic bands in rock history, had their beginnings in 1967 when guitarist Brian May and drummer Roger Taylor met at Imperial College, London and joined heavy rock psychedelic band Smile. When singer Tim Staffell quit, May and Taylor recruited the flamboyant Freddie Mercury, then front man with a band called Wreckage, to replace him. Their first UK hit single, Seven Seas Of Rhye, in 1974 triggered a phenomenal run of success, peaking with Bohemian Rhapsody which, uniquely, has been a UK chart-topper in four different years and is the third biggest-selling British single of all time. 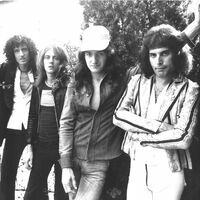 Killer Queen reached number two in the UK but broke the band into America claiming the number one spot on the Billboard 100. In 1976 Queen performed their history-making free concert in London's Hyde Park, with an audience of more than 150,000 people turning out to see them perform. 1981 saw the band release Under Pressure as a collaborative single with David Bowie. The same year, Queen released their Greatest Hits album which is the best-selling album in UK Chart history, spending 450 weeks in the UK Albums Chart. In 1985 Queen took their place as part of the charity concert Live Aid held at Wembley Stadium. The concert made record viewing figures for the TV broadcast, peaking at 1.9 billion viewers. 1986 saw the release of A Kind Of Magic, an album which featured Who Wants To Live Forever, Friends Will Be Friends and the title track A Kind Of Magic. Freddie Mercury's final tour with the band was in the summer of 1986, of which the Wembley leg resulted in the platinum-selling album Queen At Wembley. In 1991 the band confirmed public suspicions that Mercury was ill with a statement saying that he was suffering from AIDS, three years after fans started commenting on his gaunt appearance. Within 24 hours Mercury died. The band released the final album featuring Mercury four years after his death. Made In Heaven reached the number one spot in the UK Albums Chart, quickly going four-times platinum. No-One But You (Only The Good Die Young) was released as a tribute single in 1997, with May and Taylor sharing the vocals. After this release, May and Taylor, determined to keep the Queen name alive, performed at several charity concerts with guest vocalists named as Queen +. In 2002, the first performance of We Will Rock You, a musical based on the music of Queen, was held at the Dominion Theatre in London. The show went on to tour around the world, bringing the music of Queen to the masses like never before. ℗ 2011 Queen Productions Ltd. / Raincloud Productions Ltd.